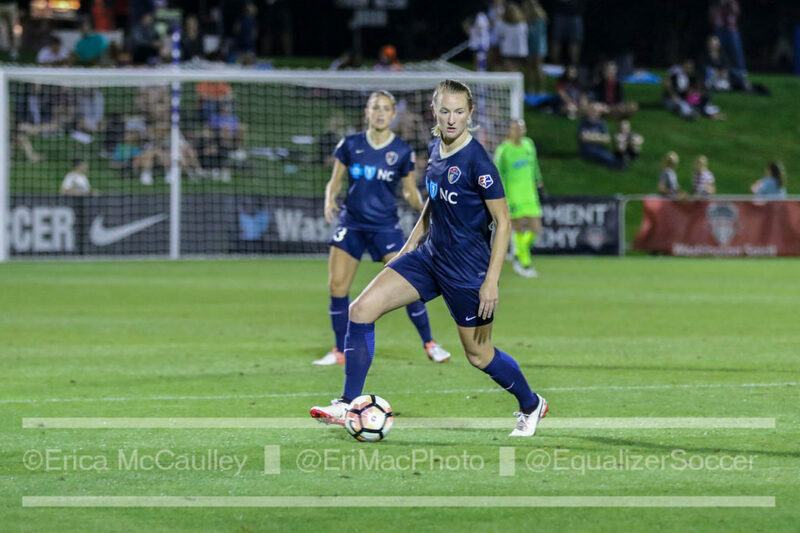 Earlier this week, Orlando defeated Chicago for the first time ever, but they’ll have to hope momentum doesn’t dissipate over a week, as the Pride have a bye this weekend. Chicago will have to try to bounce back at North Carolina, who will retain first place regardless of result (and I can’t believe I’m saying that this early in the season). On the west coast, we’re treated to the first 2018 round of the Cascadia rivalry as we round out NWSL Week 6. Can Portland’s defense overcome their missing pieces? Two facts: the Thorns haven’t lost since opening weekend, but they also haven’t won since Adrianna Franch got put on the injury report. That’s not to put their draws entirely on Britt Eckerstrom in goal – she’s been good overall, as have defenders Emily Sonnett and Katherine Reynolds. But Portland’s defense is not as rock solid as it was during its stingy 2017 championship season, and the eye test proves they clearly miss not only Franch but Emily Menges, the perennially overlooked anchor of that backline. The good news is that Menges is back in training, and could play this week after being listed as questionable, and Franch should return by the end of the month. However, first they’ll have to get past Seattle without either. And a Seattle side that is expected to have Jess Fishlock play after leaving early last weekend, but that still won’t have Megan Rapinoe. Although shoddy set piece defending allowed them to take a point home from Orlando, the team is patently not the same without Rapinoe. Too much of the attack ends up getting funneled through Jodie Taylor, who is an excellent goal scorer but not as much of a creator as Rapinoe, particularly a Rapinoe in the form she’s been in. 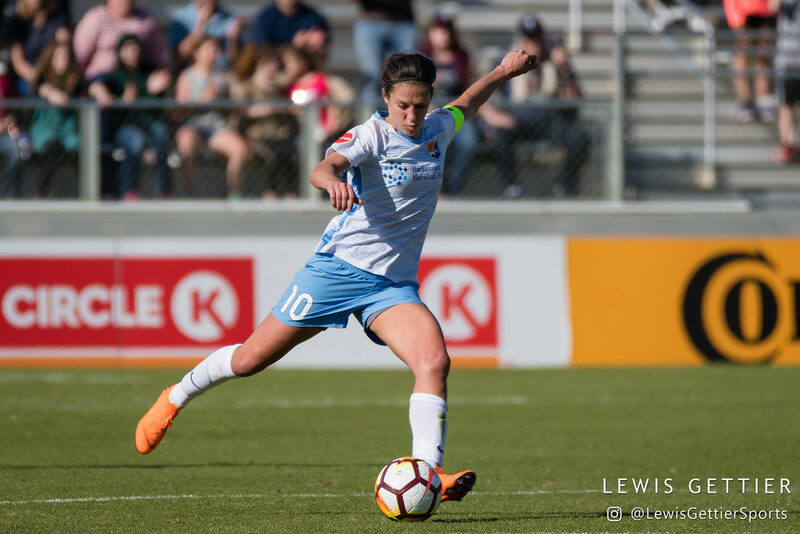 Will Carli Lloyd lead her New Jersey team to its first win of the year? Photo by Lewis Gettier. Between the two of them, the Houston Dash and Sky Blue FC have played eight games and scored two goals. I must note here that Sky Blue has played at least two less matches than the rest of the league, but that’s only part of the reason these two teams occupy the bottom of the table. Each seeks their first win of the year and under their new coach (as does Utah). 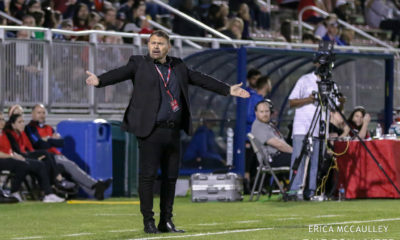 For the Dash, defensive organization hasn’t been enough, as they’ve been lackluster in front of goal and lately haven’t been able to scrape a draw. Kyah Simon needs to see more of the ball, and finishing must improve. Much of the same can be said for Sky Blue, although they haven’t been quite as disciplined defensively. They have a clear way they want to play, and though their passing game is fairly good in the midfield, it fizzles before getting near the opponent’s net. Partially due to the lack of games played, the squad just doesn’t look to be quite on the same page as one another. Players aren’t making the runs into the box that other players expect them to, and ultimately most attacks thus far have ended either in a hopeful ball to no one or an off-target shot from distance. Can Ordega keep the streak going? 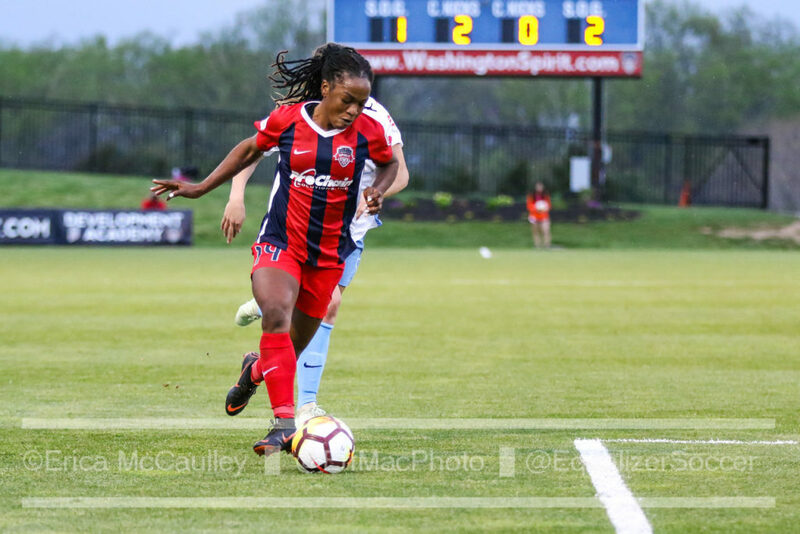 Francisca Ordega is in the best form we’ve seen from her in the NWSL. In the past, she’s lacked consistency, dealt with injuries, and hasn’t been 90-minutes fit. That’s no longer the case. She’s scored in three successive games, and just one more goal will equal her season record. 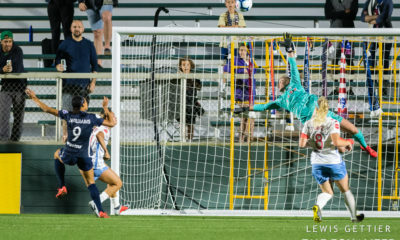 With Ordega in the forefront and the dynamic Mallory Pugh and Ashley Hatch supporting her, Washington ought to give Utah goalkeeper Abby Smith plenty to do. However, they’ll be facing the best part of the Royals: their backline. Led by Becky Sauerbrunn, who looks as good as ever after a rest from the USWNT (albeit one enforced by injury) and aided by an in-form Rachel Corsie, the Royals have the third-strongest defense in the league, statistically speaking. 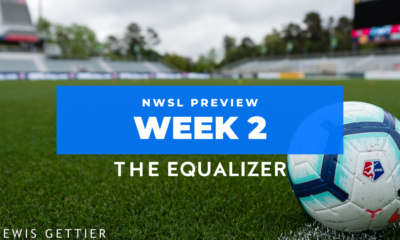 Right back may be their weakest point if Kelley O’Hara remains up top, as Sydney Miramontez still appears to be finding her footing. How will Riley reintegrate players? Courage head coach Paul Riley has what we might call “first world soccer problems” – he has too many good players. Canadian left back Allysha Chapman, normally one of the best fullbacks in the league, is already on the bench thanks to Jaelene Hinkle’s outstanding form. Now Riley has to find a way to reintegrate a healthy Sam Mewis and Debinha, returned from international duty. Mewis has been a sub so far but as a USWNT allocated player, as well as among the country’s best center midfielders, is not likely to remain so for long. Mewis has great chemistry with McCall Zerboni, also in rare form, as does Debinha with Denise O’Sullivan, so one option for Riley could be to put all four on the pitch in a box midfield. However, that causes problems further up the pitch as that leaves two spots available for Jess McDonald, Lynn Williams, and Crystal Dunn. Finishing problems, which have been on a downhill slope since her 2016 Golden Boot season, probably mean Williams should start on the bench for a while. That said, Williams, like Mewis, is allocated by the US, and Jill Ellis likes to see her players play, which could mean McDonald is the odd one out regardless of form. The answer? Probably just a rotation, although that’s not really Riley’s preferred style. I brought up the same question for Chicago coach Rory Dames ahead of Wednesday’s match against Orlando only for Julie Ertz to return to the injury report as a late scratch. The question remains whenever Ertz makes a full return, but they also need to find a way to make Sam Kerr more impactful. 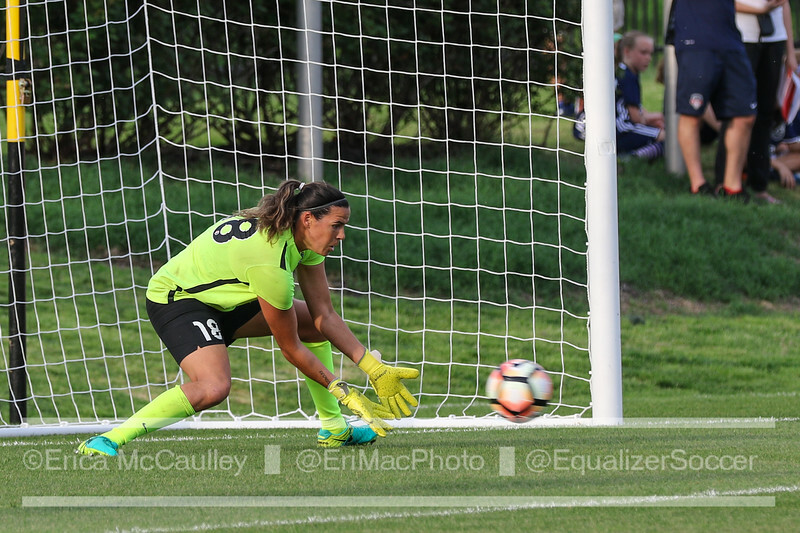 Credit must go to Orlando for swarming her every time she got near the ball, keeping Chicago scoreless at home for the first time since 2015. Time is probably the answer here, as Kerr has only played two games with the team, although she was also present for preseason. 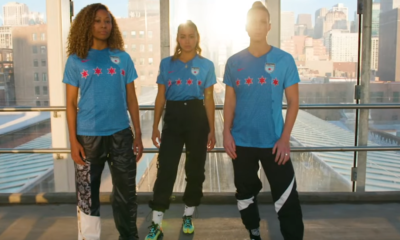 What the Red Stars need to avoid is doing what they were occasionally prone to with their last superstar striker – giving her the ball and waiting for something to happen. “New Kids” goals: Both Tobin Heath and Amy Rodriguez (we miss you, Lauren Holiday) scored superb goals last week. Free kick goals: We’ve seen some good ones this season already, and Marta’s was just the latest. McCall Zerboni: She’s taken Player of the Week two out of five weeks this year. Punching the ball instead of catching: A good goalkeeper punch gets the job done, but a poor one leads to a recycled ball and sometimes, a goal. Left backs: Jaelene Hinkle aside, has any other left back been consistently notable this year? Unbalanced schedule: There’s a lot that goes into this, but standings and power rankings look a bit ridiculous when some teams have played twice as many games as others.